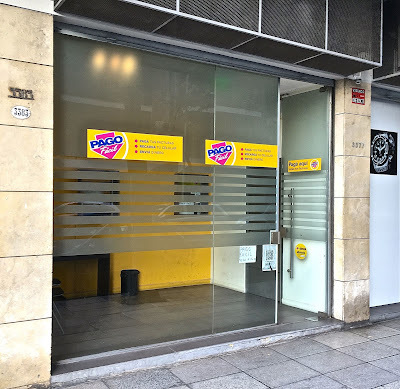 Southern Cone Travel: Argentina's ATM Annoyances - Not Going Away Soon? 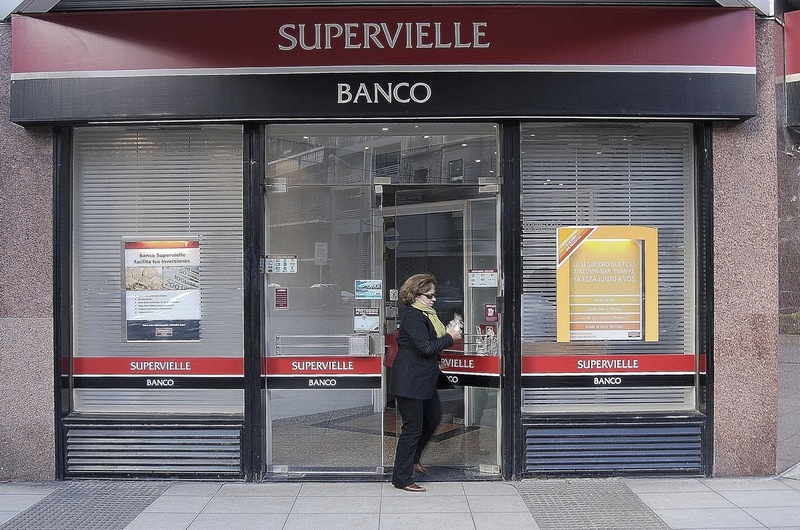 Argentina's ATM Annoyances - Not Going Away Soon? Eight years ago I deplored the fact that, when I used a Citibank ATM in downtown Buenos Aires, I had to pay an additional service charge because, according to the video screen, it was “not a Citibank ATM.” In the interim, of course, Argentine ATM usage became even more complicated because currency controls fostered a labyrinthine system of multiple exchange rates in which, at times, the official rate – offered by ATMs – was at least third less than what you could get on the informal “blue dollar” market. The downside with the blue dollar, though, was the need to carry substantial amounts of cash. Things changed considerably last December, when Mauricio Macri replaced Cristina Fernández de Kirchner as Argentina’s president and, almost immediately, unified the exchange rate system. This was a significant step but, as I noticed when I used an ATM at El Calafate in January, it wasn’t the last word on the subject. I could only withdraw 1000 pesos, about US$70, with a service charge of US$6 – more than eight percent. 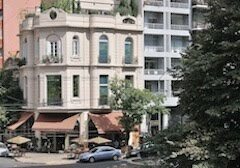 I’ve spent most of the last two months in Buenos Aires where, just in case, I brought plenty of cash dollars with me – and I’m glad I did. As it happens, there remains a small differential between the official dollar and a blue dollar that hasn’t quite disappeared – down the block from our Palermo apartment, the Pago Fácil office where many of our neighbors pay their monthly bills is also a de facto cueva, an informal exchange house where I could readily swap my US cash for pesos. In the interest of research, though, I finally decided to experiment with the ATMs again, and what I learned was not encouraging. 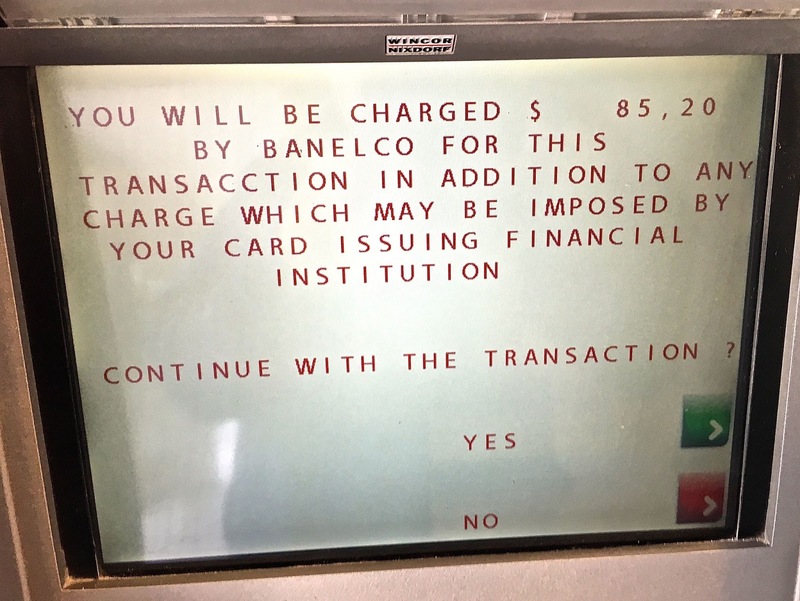 First, I went to a Citibank ATM and, after entering my PIN and requesting 2000 pesos, the machine told me my Citibank card was not valid there – rather worse than having to pay an excessive service charge (as depicted above). 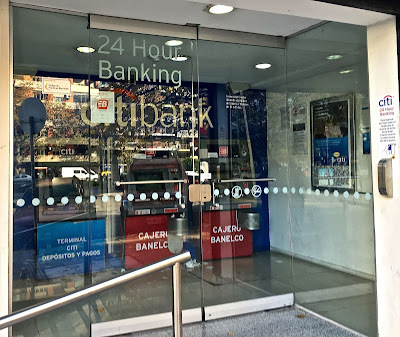 Later, at Banco BBVA, the machine told me that I could could not withdraw that same amount because it exceeded my daily limit – even though, only the week before, I had withdrawn US$300 from an ATM in Uruguay (with a two percent service charge). 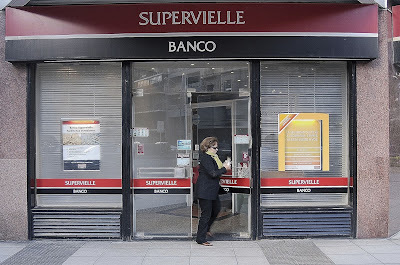 Those attempts were on a Sunday, but the next business day I asked at Banco Supervielle – two doors away from our apartment – about the limits for foreign ATM card withdrawals, and they told me that depended on my own bank. 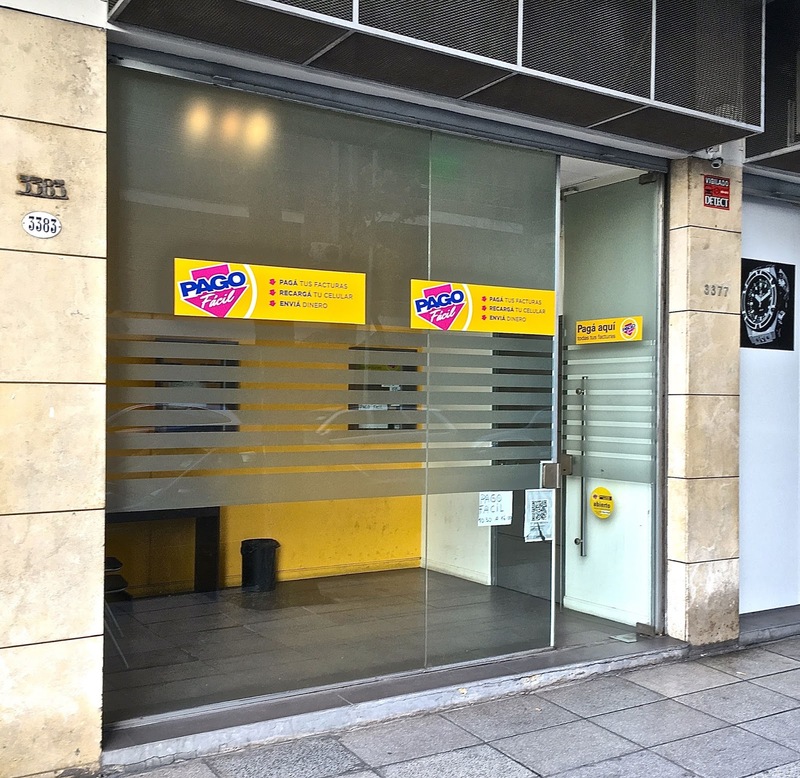 Their Argentine customers, though, could withdraw up to 10,000 pesos (more than US$700) per day. About to fly back home, though, I didn’t really want any more Argentine money (which, generally, is not a currency you want to hold). What’s my final assessment, then? For the time being, at least, it still makes sense to carry US cash and change it when convenient. 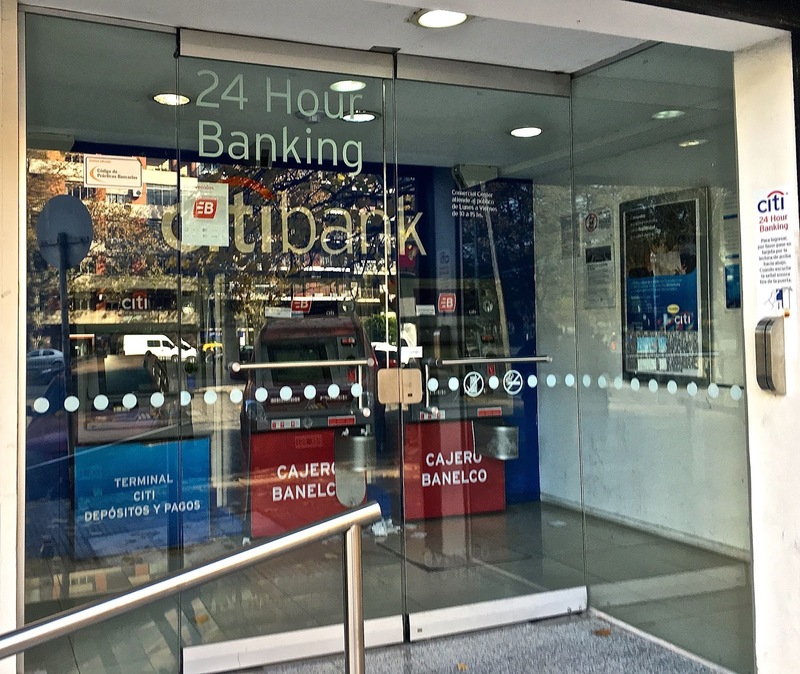 At banks and formal exchange houses, which are easy to find, you’ll get the slightly less advantageous official rate but, of course, cash entails the risk of loss or theft. Personally I’m comfortable with that, but not every visitor may feel the same. Xoom works, but it's a an awkward option for short-term visitors and, outside Buenos Aires, its locations are few. In Patagonia, they're almost non-existent. ATMs far more convenient, if only they worked as they do in Chile or Uruguay.